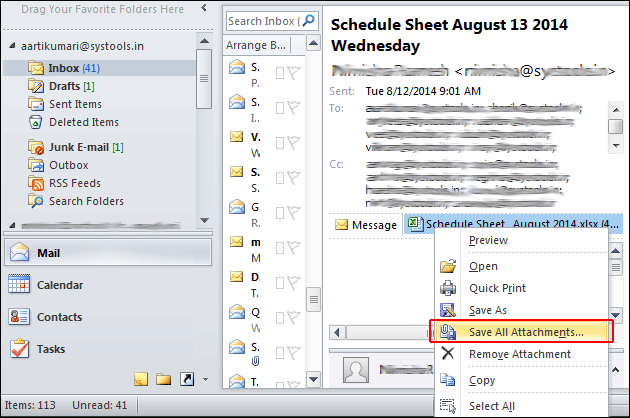 Remove Attachment from Microsoft Outlook Emails! Microsoft Outlook is continuously criticized for its file size. Either you are using older version or using latest version, Outlook users always has to face problems due to its exceeded file size. The older version (97 to 2003) of Outlook is limited up to 2 GB on crossing this limit PST files gets corrupted. In same way , In latest edition (2007 to 2013) the limit for storing data get enriched to 20GB but large size of PST files obstruct performance of Outlook. To deal with this problem, the reliable way that could be accepted is to save all attachments in Outlook emails in separate folder on computer system. Approaches to handle issues due to large size PST!! Split up PST File: If your PST file size grows up continuously with time then you can deal with this trouble by continuously splitting of PST file. But dividing PST file can lead to data manageability problems. Compress PST file: Compressing PST file size is also one of the to reduce PST file size but sometimes it leaves the data in truncated form due to that there might be possibility to loss some important data file. Archive data: You can also create archive folder in MS Outlook where older used emails can be stored and can be retrieved when required but this method does not help you to reduce PST file size. Remove Outlook Attachment from Outlook emails: This is one of the best methods to deal with large size of MS Outlook. You can extract all necessitate attachments from emails and save them at you desired end. Benefits of Extracting Attachment from Outlook Emails!! You can easily save required information from emails to your computer system and take Backup. So in this way one can save their data from loss. You can access those data even when the Outlook is not available with you and unavailability of internet connection. Share it with others person who do not have Outlook installed in their system. Due to removal of older attachments, extra space can be created in inbox to welcome new attachments in the application. Save Outlook data from Corruption due to oversized PST file and increase Outlook performance. Way to Remove Outlook Attachments from MS Outlook Emails!! 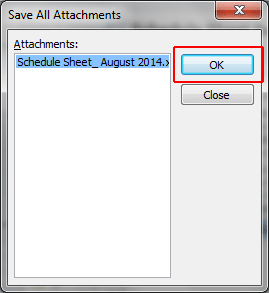 Manual Method: By manually one can easily remove attachment from Outlook emails and save them at desired location. But one of the major drawback is user has to extract attachment from multiple emails one by one. So, if you have bulk of mails in Outlook then you wish to go with the manual process of removing the attachments from mail then it will kill the valuable time of yours. Steps to extract and save attachment manually!! By using Outlook Attachment Extractor Tool: Outlook Attachment Extractor is purposely developed for those users who need to remove the attachment from all emails in multiple PST files at once. This Microsoft Outlook attachment remover holds following options to remove attachment from Microsoft Outlook. Features of Microsoft Outlook Attachment Remover !! Generates a CSV file with complete report for attachment, status, and path of folder. 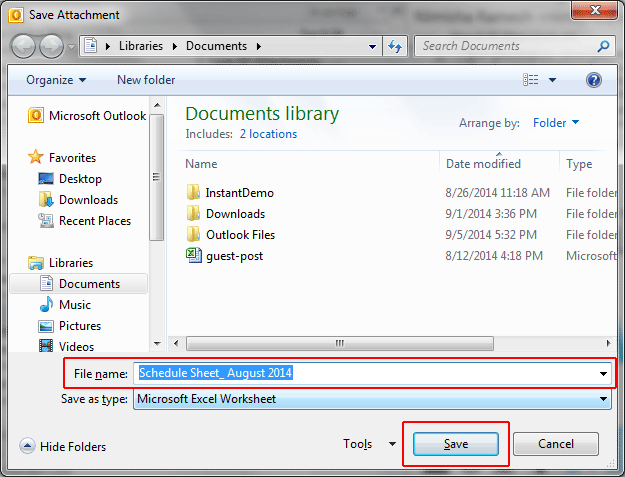 Steps to Use Microsoft Outlook Attachment Extractor !! 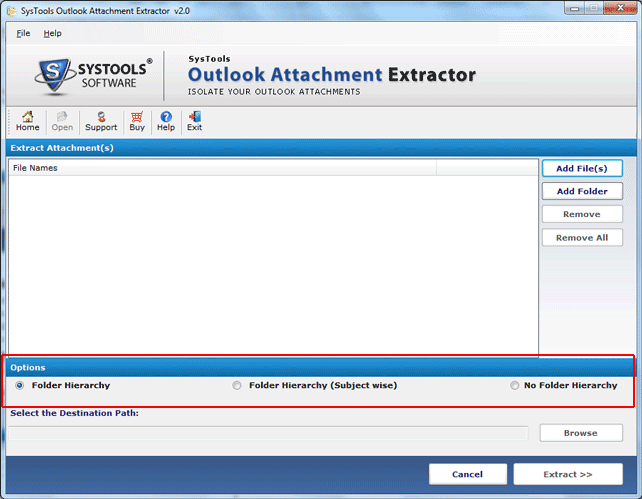 Demo Version of Outlook Attachment Extractor! Check out for free trialing software to remove attachments from Outlook. Learn how to remove attachments from Microsoft Outlook by extracting first 20 email attachments from any 5 PST files. Demo has limitation but license key version can extract unlimited attachments. The process to extract attachments from Microsoft Outlook is what we usually do. But, when you have lot of emails and oversized PST files, extraction becomes bit typical thus, Microsoft Outlook Remove Attachments via Outlook attachment extractor to minimize the burden to remove attachments.